The Eobot cloud mining service has apparently been in operation since April 2013 and is based in California, USA and we’ve known about it for quite some time, but have not tried it up until recently. The service says that their “cloud mining should be considered as a fun, recreational activity and not a source of income or investment”, so it does make reasonable promises and does not try to make you believe you will ROI in no time. It has multiple options available, apart from standard cloud mining it also offers cloud folding services, the ability to rent hashrate and point it to your on pool, or mine with your hardware in their mining pools, they even offer their own software for mining. There is also a built in faucet with small daily payouts built-in that can help you get started even without investing your own money or coins in the service plus some awards to stimulate you to return often such as a daily DOGE reward just for logging in. 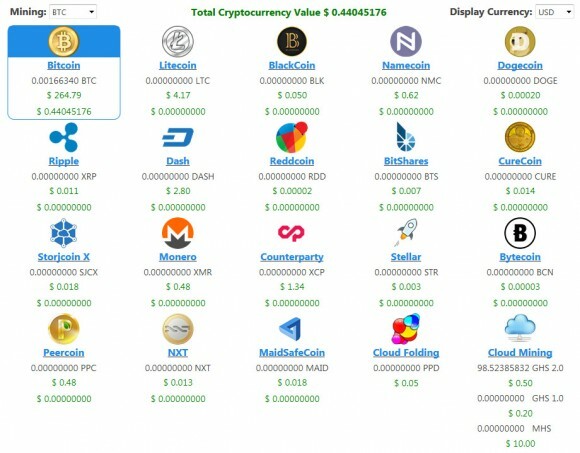 You can choose to mine not only Bitcoin, or Litecoin, but also BlackCoin, Namecoin, Dogecoin, Dash, Reddcoin, BitShares, CureCoin, StorjcoinX, Monero, Counterparty, Stellar, Bytecoin, Peercoin, NXT or MaidSafeCoin. Though the additional coins are not mined directly, but probably your mined profit is exchanged for the crypto currency you choose. At the moment the service has almost 230 thousand users registered, but apparently not that much of them actually have purchased a lot of hashrate for clud mining. There are two options available in the form of 5 year contracts – GHS 1.0 sold at $0.20 USD per GHS with a maintenance fee of $0.00232/GHS/Day and GHS 2.0 available at a price of $0.50 USD with a lower maintanance fee of $0.00117/GHS/Day. The first option offers cheaper price for the hashrate, but the profitability is much lower with the maintenance fee resulting in about 95% of what you mine. The GHS 2.0 contracts on the other hand are pricier, but with lower maintenance fee (apparently using AntMiner S5 as mining hardware) that is currently about 49% of what you mine. The mining break even time in months at the moment is almost 50 months for the GHS 1.0 and about 12 months for the GHS 2.0 cloud mining contracts according to the service stats. At some point there were also scrypt cloud mining contracts being sold as well, but these are no longer available. YOu can purchase cloud mining hahsrate or use the service as a form of crypto currency exchange, but you should be aware that when using crypto currencies to buy hashrate or to exchange between them there is a 5% fee charged. There si also support for purchasing hashrate via PayPal, but if you do so there is a rule that no withdraws can be made for 180 days after every PayPal purchase as apparently set as a precaution to avoid fraud, but not very convenient for honest miners. We have purchased about 100 GHS of GHS 2.0 Bitcoin cloud mining hashrate a few days ago to check out the service and so far everything seems to run smoothly and problem free. Interestingly enough with just about 100 GHS of hashrate the website ranks us in the top 150 users in terms of purchased hashrate from the 230K in total.